Pressure Relief Valves (PRV) tend to leak at high pressures. Customers demand a guarantee of leak tightness as a percentage of the set pressure. WEIR competitors can guarantee a higher leak tightness and therefore in certain circumstance we lose orders to our competitors. This work program is intended to understand why PRV’s leak and how to reduce or mitigate against the leakage. Improving WEIR design will support the sale of more products. The main purpose of this research is to deliver prediction methods for sealing design with specific emphasis on Weir Group Sarasin-RSBD valve products. The main objective of this problem is to be able to re-create this leakage issue using computational tools. This will be done using a combination of Finite Element Analysis (FEA) and Computational Fluid Dynamics (CFD). 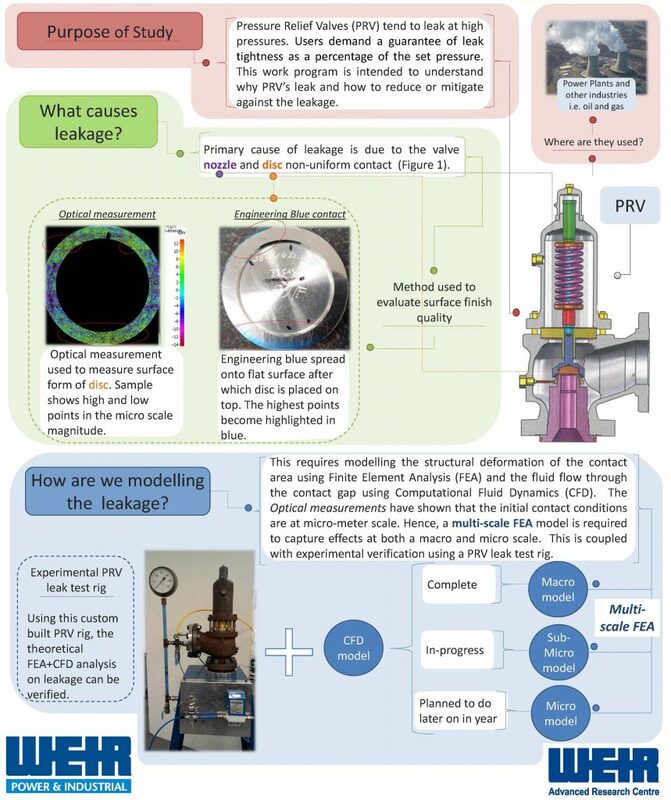 The complexities of this research lie with the deformation and surface effects of the ‘sealing faces’ of the valves at a micron and macro scale including load cycling and creep behaviour analysis. This has to be analysed and reproduced at corresponding pressures and temperatures with compressible or incompressible fluid flow using combined FEA and CFD tools. For more information about the project contact Dr William Dempster (william.dempster [at] strath [dot] ac [dot] uk), Senior Lecturer at the Department of Mechanical and Aerospace Engineering at the University of Strathclyde.